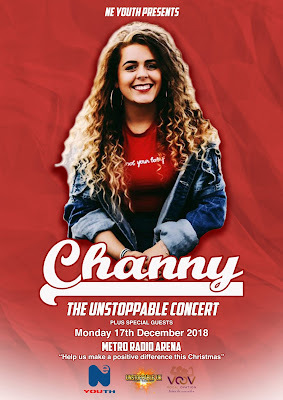 Newcastle’s own Independent solo female artist Channy, is set to rocket her career to unimaginable heights when she launches ‘The Unstoppable Concert’ in her hometown at Metro Radio Arena on Monday 17th December 2018. Channy says ‘since attending my first concert at the age of 14, I left the venue in absolute awe, feeling so inspired by the whole experience. It has been an absolute dream of mine to headline Metro Radio Arena ever since. Originating from the West End of Newcastle Channy’s down to earth ‘girl next door’ personality shines through both on and off stage. As the young ambassador for NE Youth, Channy has created a Community driven Concert supported by NE Youth, who she is donating 50% of the profits, so they can continue the great work they do. Together as one, Channy and NE Youth are making positive change and inspiring other young people that ‘anything is possible’. As schools, community groups and fans join us to attend the concert; Channy is making it her goal to be the role model that she needed growing up. Using her musical talents, her mission has been to prove, no matter your background, you only get out of life what you’re willing to put in. Come along to enjoy the Unstoppable Party as Channy brings the festive season to life, inviting special guests, dancers, a DJ and competition winners to join her in celebrating the release of her debut single, at an unprecedented stage experience of epic proportions. Tickets are available online from our affiliate Ticketmaster UK: http://bit.ly/ChannyArena , from the booking hotline number 0844 493 6666 or in person from the Metro Radio Arena Box Office. Please note venue facility and booking fees will apply.